Food has the power to heal. And to soothe seething tempers. As was proven during this yearâ€™s World Food Expo, because despite feeling murderous during the whole getting inside thing, strolling around, surrounded by copious amounts of food easily made me happy again. I mean, one of the first things I set eyes on was a big cow printed piece of machinery. You can just imagine how big the smile on my face was after seeing it. I honestly have no idea what it is. Mixer? 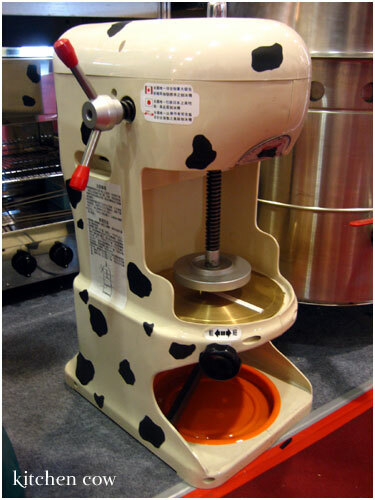 Ice Cream maker? Giant squeezer? Torture Device? All I know is that it’s cute and it makes me go Moo! 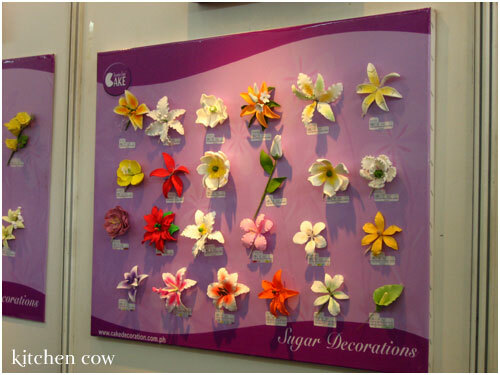 Another interesting booth was the one with the gumpaste flowers. While gumpaste flowers are nothing new, the amount of detail on the ones shown there was astounding. No wonder everybody was snapping photos of the display. With these flowers, imagine how much easier it would be for the average home baker to create beautiful cakes without needing to go take cake decorating classes. 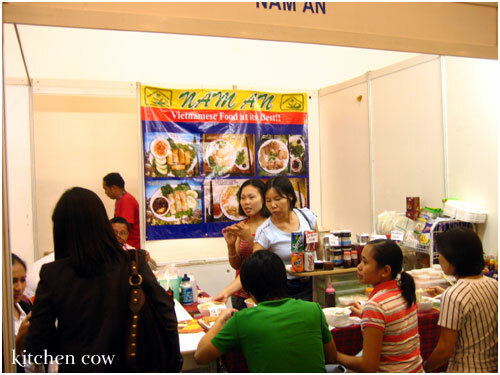 Because we hadn’t eaten yet, we wanted to try eating the various dishes on sale at the Nam An booth. Unfortunately, it was quite full and we couldn’t find a seat. Everybody looked satisfied with what they were eating so it was probably good. 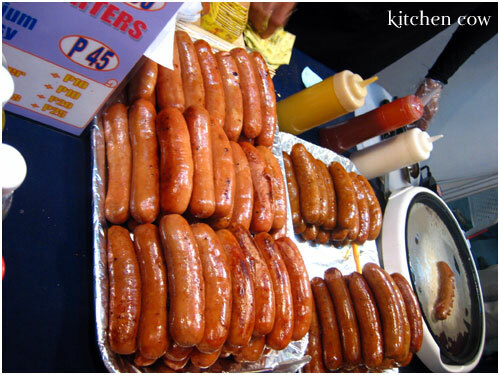 Instead, we grabbed a Hungarian Sausage from this stand. It tasted okay enough. Not as finely made as the Hungarian Sausage from delis like Santis, but for the price, it was worth it. I imagine this would be good to sell ala ready-to-eat Hotdog Cart. 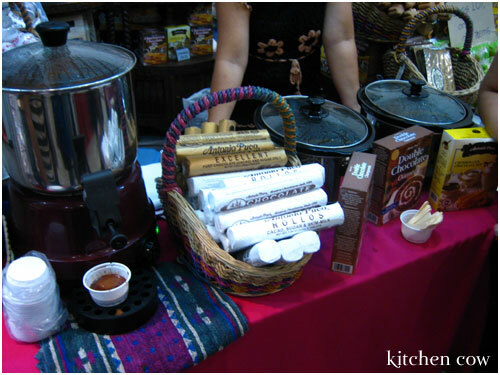 At the Antonio Pueo booth, we bought some instant champorado (chocolate porridge) and tablea, the cocoa tablets used to make Spanish style hot chocolate. While most Antonio Pueo products are available at retail stores, we never bought it because we didn’t know how good it was. Thanks to their free sample however, we discovered that despite being an instant food product, the champorado tasted close to the homemade kind my grandmother used to make from scratch. It was a far cry from other instant champorado brands that we’ve tried before. Another booth which made my wallet bleed was the Milk Tea booth. 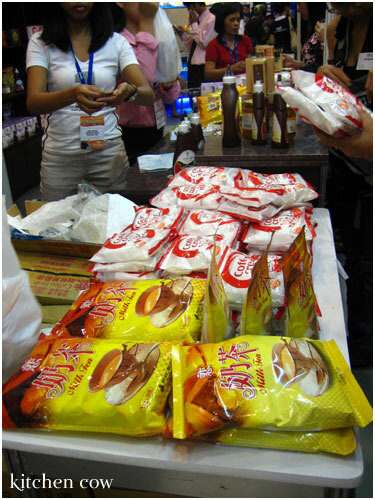 They also had a booth at last year’s WOFEX but because they ran out of it, I wasn’t able to buy any of their powdered Milk Tea. This year though, I was able to grab a large bag. After buying, I should’ve known better than to linger, because I ended up buying a bottle of the Lemon Citron teaâ€”this other woman customer vouched that it was wonderful, sure enough, the sampler they served me proved itâ€”and a box of Lavender Milk Tea. your day seemed like fun! thanks for the great photos. your pictures took us there too, somehow. congratulations on your cow-finds! i think the cowprint machine is an ice shaver. just a guess, though. How did you make a 2-page blog entry?! Geekiness aside, I tried that fried ice cream thing once and I was terribly disappointed. As you said, I was expecting it to be FRIED. It’s just a diffrently shaped ice cream. And the flavors were nothing special either. Bleah. Glad you enjoyed it. And yes, I was ecstatic about the cows, heehee. Hey, that’s a good guess! Now that you mentioned it, I can see where you can put the ice. And the shaver blade. Plus cows = milk = ice cream = shaved ice! I think you’re probably right. isn’t there really a recipe for fried ice cream? like you put it in a bun, cover it with bread crumbs and then dee-fry it in oil. or something like that. i do know that the chinese have a recipe for fried ice cream. but yeah, i don’t think it would be fair to call it fried ice cream if you blast froze it. i guess, it’s all about the marketing. Yes, there is. I once had REAL (haha) fried ice cream in a German restaurant – didn’t expect something extraordinary like that there, but then… I couldn’t resist and had to order it, despite the fact that I was already stuffed. Good choice! It was ordinary vanilla ice cream, coated with some kind of pretty liquid “dough” which had grated coconut in it. It was really fried (don’t know if it was deep-fried or pan-fried, but well.. at least fried :D) and the ice cream inside was melted, except for the core. Delicious! I don’t think, that’s the Chinese recipe for fried ice cream, but nevertheless it was mouth-watering. That’s a torture device! You should get the organizer’s head (the one who won’t let you in) and shave his brains. Houuuu~~ That really looked fun. Was there takoyaki in this expo? There are many versions, yours is one of them. But I think all of them, to be really called fried, needs to be cooked in oil. Once I got past my pissy-offness yeah, it did turn out fun. Takoyaki in general. I’m looking for other sources besides Kozui in QC. Fujimart in QC has frozen takoyaki, you just have to nuke it methinks. I buy mine from New Hatchin Grocery along Kamagong in Makati. They sell it cooked, I just freeze it myself then microwave then the mood hits. On Saturdays, they have an actual Takoyaki booth instore, I hear, but I’ve never chanced upon it. There’s also a local franchise of Takoyaki (Chito’s Takuyaki). There’s a pic at the Mafbex post but I’ve no info about the branches other than the one at SM Molino. Chito’s reminds me more of okonomiyaki though, since it’s chockful of veggies with little octopus, unfortunately. I eat takoyaki for the tako! Gimme my octopus chunks! SM Hypermart Molino, in Bacoor, Cavite 😀 It’s at their teeny-tiny food court.